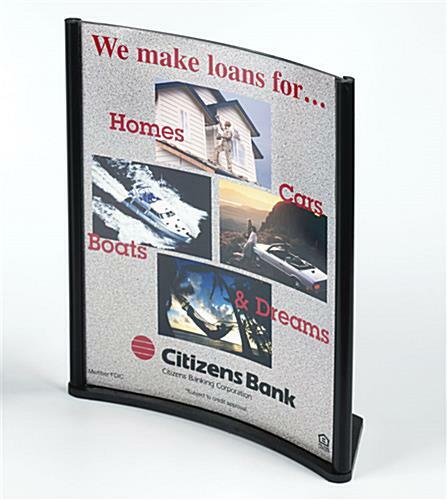 This retail sign holder fits any 8-1/2" x 11" retail signs! We supply an assortment of retail signage options, many of which are in stock today! This retail sign holder features a concave design for an attractive, upscale appearance. 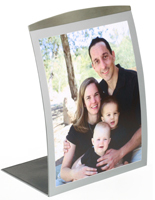 Each retail sign holder can hold a standard, 8-1/2" x 11" sheet right from your printer! Create advertisements and retail signage with ease!This store fixture, retail sign holder features a decorative black plastic base and side columns. 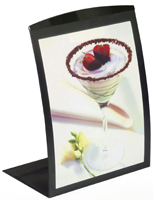 The retail sign holder is single sided, making it ideal for use on countertops. 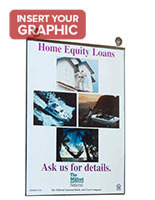 Your graphic slides in from the top, is protected by a clear acrylic covering and is supported by a black plastic backer.